The spectre of the Islamic State in Iraq and Syria casts a long shadow. It’s clearly not just the Middle East that is in trouble; both Britain and the United States have been worried enough to dispatch fighter jets to try and contain the Islamist rebels who have carved out huge chunks of territory as their own. The aerial war has also drawn in Saudi Arabia and the United Arab Emirates, while various radical Islamist groups from India to Indonesia have pledged their support for the rebels. Analysts (including myself in this Institute for Security Studies policy brief) have warned that Africa is particularly vulnerable. The continent’s plethora of existing Islamist groups, coupled with its poor governance track record, make it a relatively ­­easy target. This, however, is now old news. The Islamic State and its subversive ideology continue to move at a pace that journalists, researchers and policymakers just can’t match. The fact is, Africa isn’t facing a potential threat from the Islamic State, because that threat has already arrived – and is destabilising several African countries. It began in Nigeria, where Boko Haram has dramatically altered their tactics over the last few months to mirror those of the Islamic State. In addition to their more typical hit-and-run attacks, the group has started to occupy towns and villages in north-eastern Nigeria, and declared that the territory under its control is part of an Islamic Caliphate. (Boko Haram has not explicitly declared allegiance to the Islamic State’s Caliphate, but perhaps this is implied.) Like the Islamic State, Boko Haram is imposing its fundamentalist version of Islam everywhere it goes, forcing residents to observe strict Islamic sharia law or be killed. Then in Libya, in late July, Islamist militant group Ansar al-Sharia’s battle for control of Benghazi was given a vital boost with the arrival of hundreds of new fighters. These were Libyans who had been fighting under the banner of the Islamic State in Iraq and/or Syria, until ordered home by the Islamic State’s top brass. It is no coincidence that shortly after this decision was reached, Ansar al-Sharia was able to take strategic parts of the city, and declared it to be an Islamic Emirate independent from the rest of Libya. So far, however, the Libyan example – of direct intervention from the Islamic State in an African conflict – is the exception. More prevalent is the copycat model, where African groups have seen the success of the Islamic State and patterned themselves accordingly. Take, for example, Ansar Bayt al-Maqdis – a militant group based in Egypt’s Sinai Peninsula, which has launched an aggressive campaign of attacks against Egyptian military and government targets. These have been accompanied by a series of brutal beheadings, complete with staged confessions and a slick, albeit gruesome, video. Videoed beheadings, distributed widely over social media, are something of an Islamic State trademark; the high-profile examples of Western journalists and aid workers were certainly not the first such recordings. Will the Islamic State accept allegiances indiscriminately, even if this could damage their brand? Or take the newly formed Jund al-Khilafah (Soldiers of the Caliphate) in Algeria, thought to be a splinter group from al-Qaeda in the Islamic Maghreb. Jund al-Khilafah is one of the few groups in Africa to openly declare its allegiance to Abu Bakr al-Baghdadi, leader of the Islamic State and self-declared emir, and it too has capitalised on the propaganda value of a recorded execution. Its first terrorist act as a group was the kidnapping and then beheading of French tourist Hervé Gourdel, although its production values are not quite as slick. The video was noticeably poorer in quality than those typically produced by the Islamic State, and the executioners themselves looked uncomfortable and unskilled. This might seem like a flippant point. Who cares about production quality when people are being murdered on camera? But it is actually quite revealing. Whereas the Islamic State’s videos are carefully calibrated propaganda efforts, Jund al-Khilafah’s was a sloppy imitation with no obvious purpose except to demonstrate loyalty. It is also even more gruesome, thanks to those inexperienced executioners. 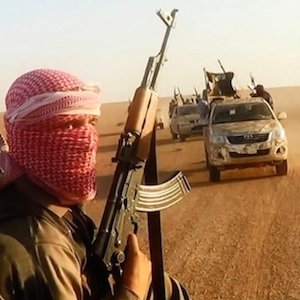 This raises important questions for the Islamic State as it seeks to expand. Will it accept allegiances indiscriminately, even if this could damage their brand? Or will it copy the al-Qaeda approach and vet potential allies and partners before allowing them to speak in their name? In a way, the Islamic State is in danger of becoming a victim of its own success as its influence grows too far and too fast. Africa, however, is in far more danger, and its leaders will need a clear and coherent counter-terrorism strategy in order to counter not just the Islamic State, but also the copycat groups and activities that it has inspired. Fortunately, such a strategy exists. At an extraordinary meeting of the African Union’s (AU’s) Peace and Security Council (PSC) in September, the PSC adopted a raft of measures aimed at improving both the quality and scale of the continent’s counter-terrorism efforts. These include wholly sensible plans to improve criminal justice systems and border controls; tighten controls on financing for terrorist groups and money-laundering; improve intelligence-sharing and coordination between states; and emphasise the need to uphold the rule of law and protect human rights. But any strategy is only as good as its implementation, argues Solomon Ayele Dersso, a senior researcher at the Institute for Security Studies. If it is going to work, it has to be given precedence over the approach that has been generally favoured by governments participating in the ongoing military campaign against the Islamic State. ‘Implementing the AU instruments and frameworks on counter-terrorism – and doing so promptly and systematically at regional and national levels – is important. However, the bigger issue is the danger and tendency to ride on the international military response against the Islamic State, and expand the application of an exclusively militarised response to situations in Africa, particularly in the context of Libya,’ said Dersso. For the most vulnerable African countries to have any hope of containing the influence of the Islamic State (Algeria, Libya, Kenya, Mali, Nigeria and Somalia spring to mind immediately), their governments must adopt and implement the PSC’s recommendations as soon as possible, and hope that the Islamic State’s appeal wanes as its footprint on the continent grows.